The CLARIOstar® is BMG LABTECH’s most flexible microplate reader, equipped with revolutionary LVF monochromator technology.Versatile, high-performance microplate reader. With its triple technology - monochromators, spectrometer, and filters - it does not compromise on sensitivity or flexibility. 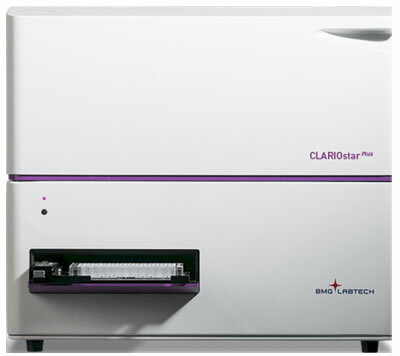 The CLARIOstar® is BMG LABTECH's newest microplate reader. It's a versatile, high-performance microplate reader equipped with BMG LABTECH's revolutionary LVF monochromator technology. Thanks to the triple technologies available - advanced LVF Monochromators, highly sensitive filters, and an ultra-fast UV/Vis spectrometer - it does not compromise on sensitivity or flexibility. It is a modular microplate reader with up to eight different detection modes: fluorescence intensity (including FRET), fluorescence polarization, luminescence (including BRET), UV/Vis absorbance, time-resolved fluorescence (including TR-FRET), and AlphaScreen®/AlphaLISA®. The CLARIOstar® Microplate Reader delivers high performance in all detection modes but its versatility does not end there. The CLARIOstar® is also ideal for assay development. Anything is possible. Any wavelength. Any bandwidth. Any assay. NEW: The CLARIOstar® is now available with an Atmospheric Control Unit for all your live cell-based assays! What makes this instrument so special is that it is the only plate reader capable of taking readings immediately after trigger injections. It accomplishes this feat using the SPARCL Assay Protocol. SPARCL assays have the ability to start reading reactions directly after the injection step so they can record the spike that happens immediately after sample is injected. SPARCL refers to an immunoassay that does not require washing steps. An analyte in a solution is detected by binding two antibodies: one is coupled to horse radish peroxidase (HRP), the other is coupled to the HRP substrate Acridan. In the presence of the analyte, binding of both antibodies brings the enzyme and substrate into proximity. The enzymatic reaction is started by the addition of H2O2, which immediately produces a light proportional to the amount of analyte. Thus, SPARCL assays begin reading when the trigger solution is injected. Please contact your local DSS representative for upgrades including options such as detection modes, reagent injectors, etc.